In a medical emergency, every second counts. That’s why our Emergency Department at Fulton County Health Center is committed to providing high-quality care. 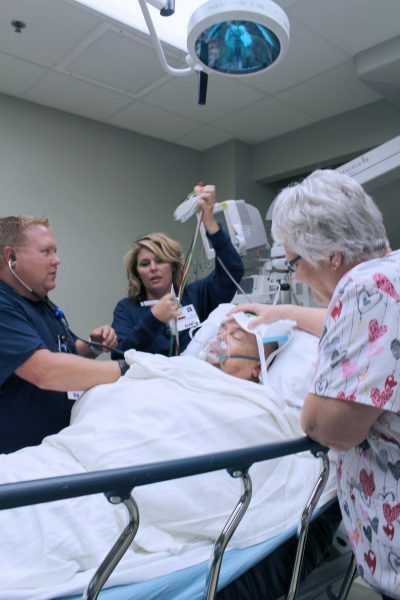 Serving more than 16,000 people this past year, the Emergency Department is staffed with physicians, registered nurses and allied health personnel, specifically trained in the full spectrum of emergency health care needs and problems. Our goal is to meet the immediate healthcare needs of our patients and provide direction for follow up. When you are here to visit our Emergency Department, it’s because you or someone you care about is sick or injured. To better educate you on what to expect, we would like to explain the process that occurs while you are visiting and explain some of the experiences you may have while visiting our ER. At Fulton County Health Center, our Emergency Department operates 24 hours a day, 7 days a week, with a physician on duty at all times to provide emergency care for patients of all ages. We also have a Nurse Practitioner seeing patients from the hours of 11 am to 11 pm. All our RN’s are ACLS (Advanced Cardiac Life Support) and PALS (Pediatric Advanced Life Support) certified. In addition many RN’s have taken the Trauma Nurse Core Curriculum to further meet the demands of emergency care. Whether you bring yourself, a family member brings you, or you are brought to the hospital by ambulance, you will speak with a nurse about why you are here. The nurse will gather information such as why you are here, medications you take and important information about your past medical history. This nurse will also want to take your temperature, heart rate and blood pressure. Specific tests may be ordered depending on your triage assessment such as an EKG or x-ray. This information is made immediately available to the Emergency Department physician and or a nurse practitioner. In most cases you will be seen by a doctor or a nurse practitioner within 30 minutes of arrival to our ER. Once your condition is determined to be stable, your next step in the process is registration. You (or if you are too ill, a family member) will speak with one of the registration clerks. The registration clerk gathers information necessary for the registration process such as your name, address and who your regular doctor is. The clerk will also review your insurance information. The registration clerk will also need to ask you or your family member to sign a consent form. This gives us permission to treat you in the Emergency Department and to bill your insurance carrier. Ongoing care by a nurse assigned to your care for you. You may have blood drawn for laboratory tests. These tests may take as long as one hour or more to be completed. You may have x-rays, CT scan or EKG to help with the diagnostics of your presenting symptoms. During your time in our Emergency Department, the nurse plays a key role in you comfort and recovery from your presenting symptoms. We encourage you to ask your nurse about medications, procedures and times. We hope that this will help you understand what to expect while visiting the Emergency Department. Many patients who come to our ER may need only short term emergency care. If you are discharged you will be given treatment recommendations, referrals and in some case prescriptions to help in your recovery. When the emergency is more serious we can offer higher levels of care that may require a hospital stay. If however a patient’s condition warrants a higher level of care than we can provide, we can make referrals to a higher level tertiary care hospital when necessary including arrangements to provide ground or air emergency transport.